New York Times and USA Today bestselling author L. P. Dover has written countless novels, including the Forever Fae series, the Second Chances series, the Royal Shifters series, and the stand-alone title Love, Lies, and Deception. She lives in North Carolina with her husband and two daughters. Visit her at lpdover.com. 4 Stars for High Sided. I loved this second chance story. High Sided was the perfect mix of second chance romance and romantic suspense. The plot wasn’t filled with angst or drama surrounding the couple, the suspense was focused on other elements to the story that made the novel feel even deeper. I loved both Logan and Kassidy. They were both well developed characters. I felt their chemistry instantly and I was immediately holding things would work out for them. Even when this couple were fighting I could still feel the love they have for each other. Throughout the whole story you can feel their passion for each other which makes you fall in love with them more. I also liked the mystery element to this story, it gave another layer to the novel and had me turning the page. The balance between angst, mystery and romance is perfect in High Sided and I really enjoyed it. L.P. Dover writes amazing stories and High-Sided was no different. She did an amazing job mixing Logan's past, the present, and what he missed while he was gone. She also did an amazing job with the suspense. Dover introduced just enough characters to keep you guessing who the bad guy was. When you think you figured it out, because she plainly gave you reasons to say it was this or that character, she did a plot twist, and NOPE! I can honestly say I was shocked at the end. But that's what makes a good suspense story. One that can keep you guessing till you think you have it figured out, just to realize it's not what or who you think it is. As always, I love that Dover writes strong female characters. Kassidy was heartbroken when Logan broke up with her, after a terrible racing accident years ago. But she kept her head high and continued on with her life. She accomplished the things she set out to do. Logan turned out to be sweet and protective over Kassidy and her family as ever. Their relationship was sweet, flirty, steamy, and protective. 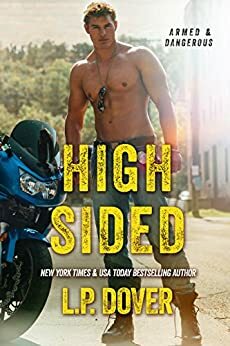 High-Sided is a definite recommendation for the readers who love a second chance, suspense, sports related (motor bike racing), romance. What a great example of a 2nd chance love story. It shows how true love never dies. The story starts 8 years before when championship motorcycle racer Logan was terribly hurt on the track while racing and it left him paralyzed. Torn up over his injuries, he decided he couldn’t face living that way with his girlfriend, where she watches him in that condition, especially since he loved her and didn’t want her to be stuck with him like that. So he cruelly broke up with his then girlfriend, Kassidy, and subsequently left town and left Kassidy. Fast forward 8 years…Logan is now an FBI agent who is coming back to the scene of the crime so to speak. He is coming back because his best friend called him for help. There are some seriously strange events happening at the track and they are too big of a coincidence to just not be a fluke. Now Logan is ready to come back, to help his friend , figure out what is going on at the track and also figure out what happened to him all those years ago with his “accident” and win back his the love of his life, Kassidy. This story has so much going on which is fantastic. There is mystery, suspense, passion, angst, anger, heartbreak and above all love that has been all this time. Their chemistry, connection and banter really was fantastic. I enjoyed the pace of the story from start to end. I cannot wait to see who book 4 will be about. 4.0 out of 5 starsA Total High Octane Ride! What a high octane ride!! Logan and Kassidy's second chance was well worth the wait! HIGH SIDED is L.P. Dover’s newest Armed & Dangerous novel and is Logan Chandler’s story. I first met Logan in ROPED IN and am so glad he’s finally getting his time in the spotlight! Logan returns home when he's called to help figure out who's trying to sabotage his former race team. As a FBI agent Logan is used to going undercover, but this job may take more than his job skills given that the girl he lied to and pushed away years earlier is now co-owner of the team. Can you really go home again? Can you rekindle what you pushed away, but never really let go of in your heart? Kassidy Bennett is still reeling from the death of her mother, and now not only the attacks on her team but this blast from her past. Kassidy has never really gotten past the heartbreak Logan caused her when he pushed her away and disappeared from her life. So can she forgive Logan? Can they find what she thought she'd lost? Can they figure out who's out to hurt those she holds dearest before they strike again? L.P. Dover once again writes a story that makes me keep turning the pages! All the varying stories merged together so well to create such a dynamic and drama filled ride. Loved seeing Logan & Kassidy reconnect and find peace. Loved all the supporting players as well. Good characters, good history and lots of twists and turns. Nothing not to like in this one and I can't wait to get more in this series! 4.0 out of 5 starsHad quite a bit of twists and turns that kept me interested. Logan and Kassidy have not seen each other in 8 years. After a horrible racing accident, Logan believed he would never walk again and broke up with Kassidy before leaving town. Kassidy has never gotten over Logan but has no idea where he is or what he does. Unbeknownst to Kassidy, Logan has kept tabs on her and kept in contact with 2 people close to her. When someone close to her is killed, Logan reappears on the scene and utilizes his knowledge as an FBI agent to try and figure out who is responsible for his friend's death. There were some twists and turns in this book and Kassidy did seem to forgive and forget Logan's betrayal quite quickly. They both were able to get back into the swing of things quite quickly and it was hard to wrap my head around. Kassidy was lied to by her dad and kept in the dark about several secrets, yet seemed to have no problem brushing it off. Trying to figure out who was trying to hurt Kassidy's dad, friends and family was quite a bumpy ride for her. Did kind of get annoyed with how Kassidy was quick to "hit" anyone who made her made and she perceived as an enemy. For a 26-year-old woman, who supposedly ran a business, she had some serious anger issues and exhibited juvenile behavior. It was a decent read and flowed well and was an overall good addition to this series.